Breaks into rapture even now! As tho he would a world o’erwhelm. “Don’t cry for me America. 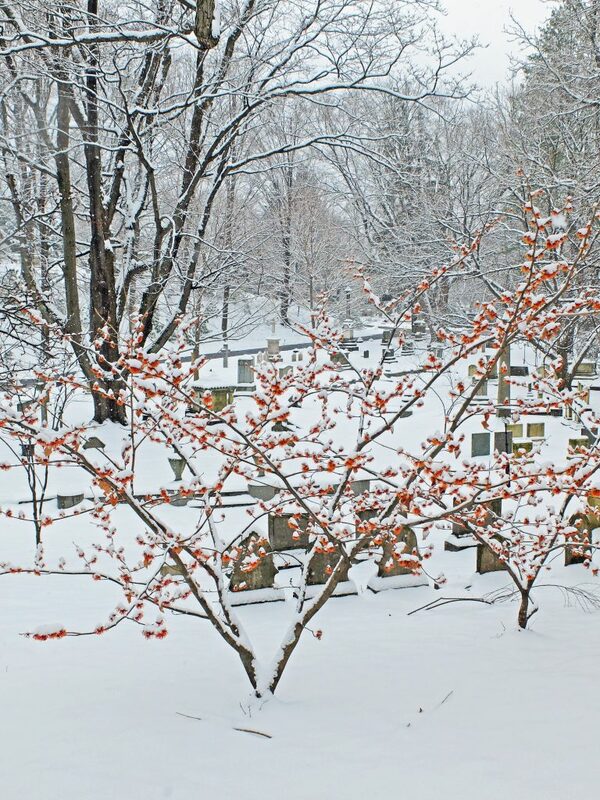 I never left you,” scattered locations within Mount Auburn seem to speak to us anthropomorphically. 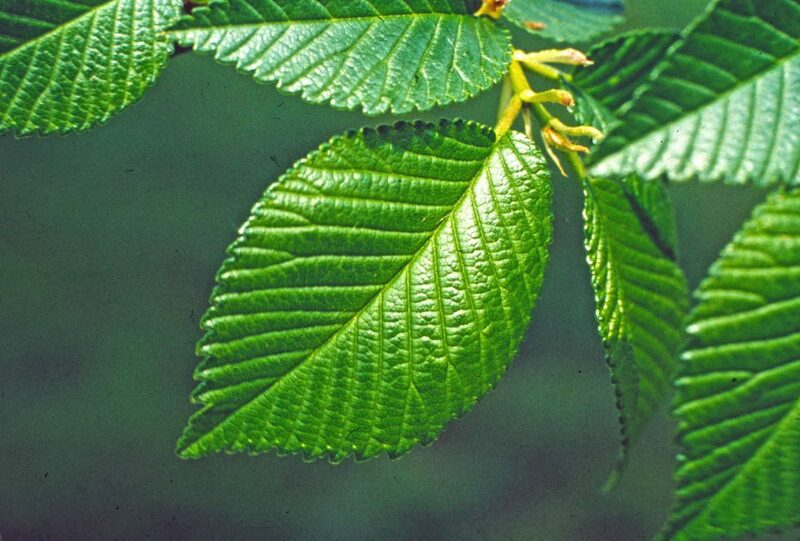 If not with these exact enunciated words, the continuing presence of the oft described canopies of American elms prove these much beloved arboreal sentinels never reached the comparable nadir of our American chestnuts. 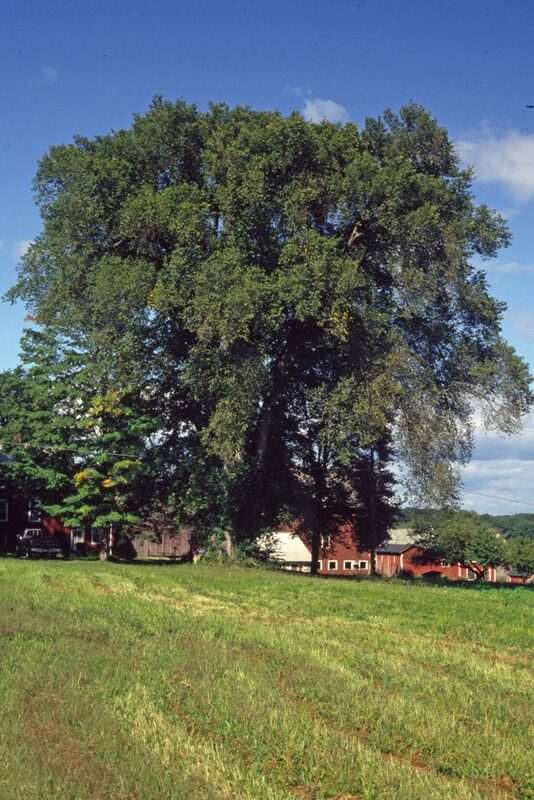 Nonetheless scores of millions of American elms have died over the last eight decades due to Dutch elm disease (DED). 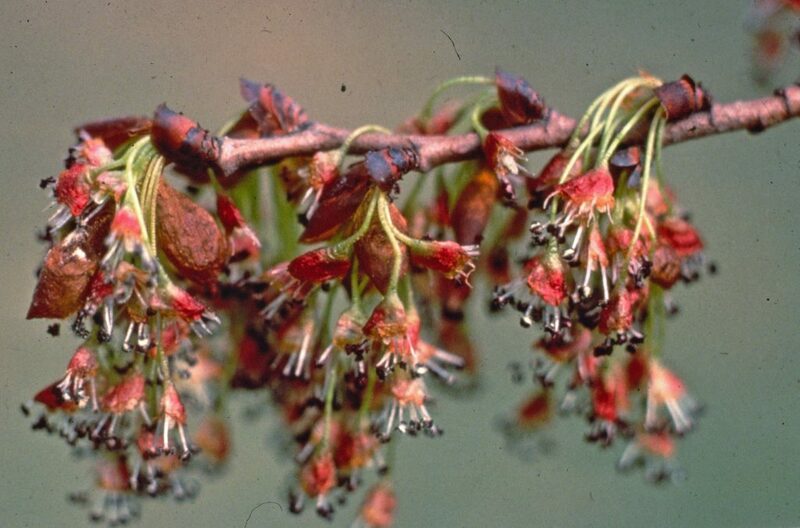 Yet each April, we continue to count on one reliable phenological sign of New England’s spring, the American elm flowers, collectively tinting winter’s former stark canopies a light, purplish/red color. Weeks before other spring ornamental notables such as forsythia, cherries, magnolias, dogwoods, etc. 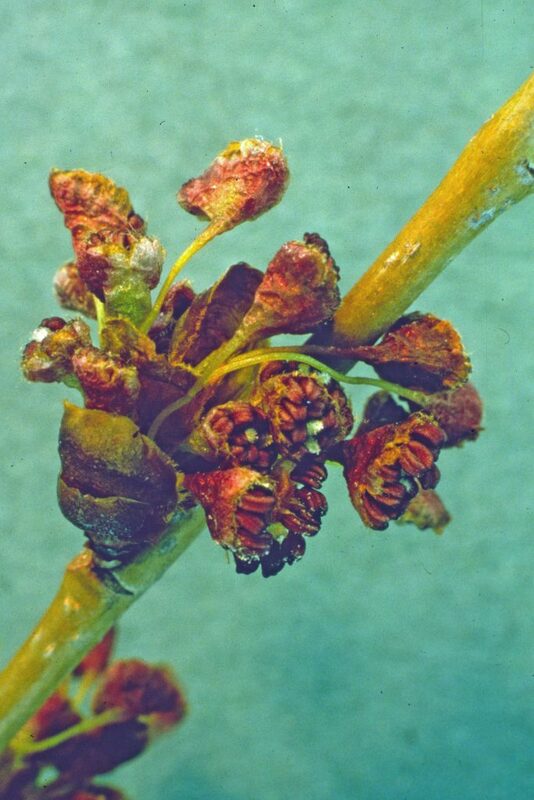 and well before producing leaves, these flowers are commonly overlooked.Maya Angelou has stated,“Everything in the universe has a rhythm, everything dances.” Hence, after winds as well as early insects have danced through these flowers, cross-pollination fertilizes ovules which develop into elm seeds. 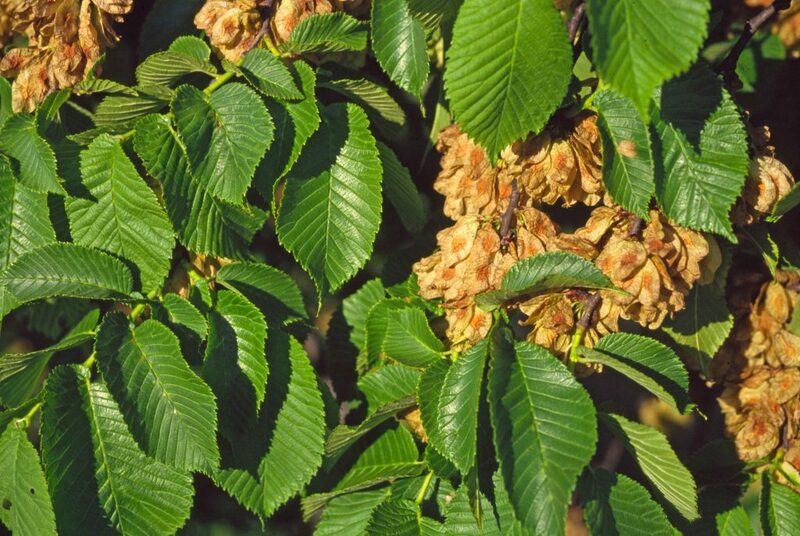 These ½-inch, rounded samaras (winged, light-weight seeds) mature in May and can be blown considerable distances from the parent trees. It’s no good whispering stuff; just blow! 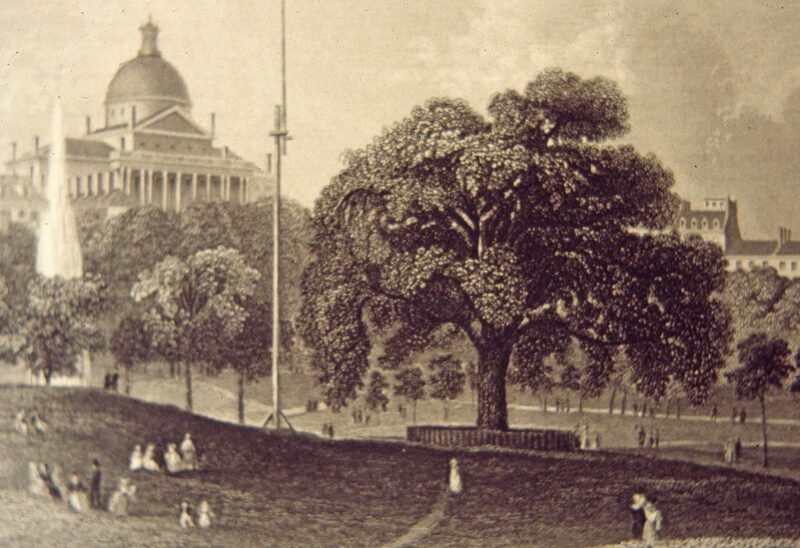 Thomas J. Campanella has authored, Republic of Shade: New England and the American Elm, the definitive overview of this once popular shade tree dominating streets in towns and cities across the country, even designated the state tree of both Massachusetts and North Dakota. 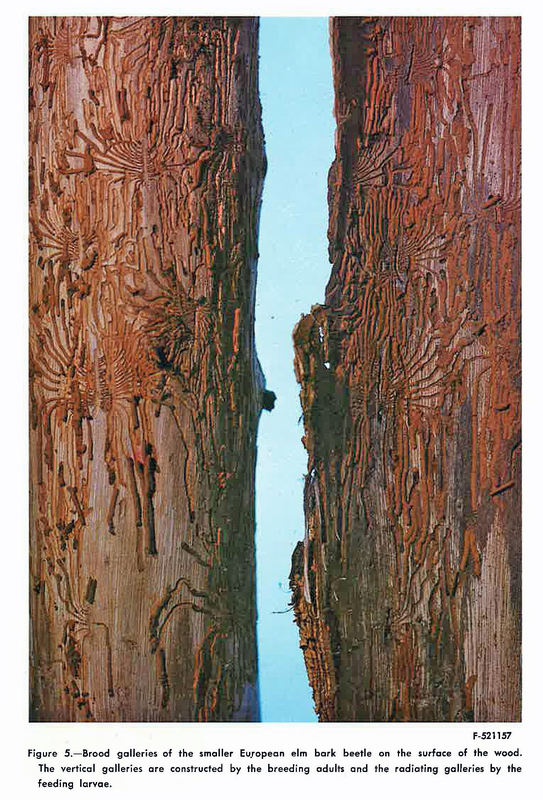 Then in the 1930’s, a vascular wilt disease (DED) was accidentally introduced to the U. S. likely on logs imported from Europe for use as veneer. DED is “Dutch” (actually Asian) because early researchers identifying the fungus were Dutch. DED was a problem in Europe 20 years before coming to our country. Causal organism was initially determined to be the fungus Ophiostoma ulmi (formerly Ceratocystis ulmi) with later an additional more aggressive Ophiostoma novo-ulmi. Compounding and exponentially exacerbating the pathogen virulence were European bark beetles. Transporting fungal spores from infected trees, they bored into the outer bark of elms, making tunnels (called galleries), mating and leaving their eggs under the bark. 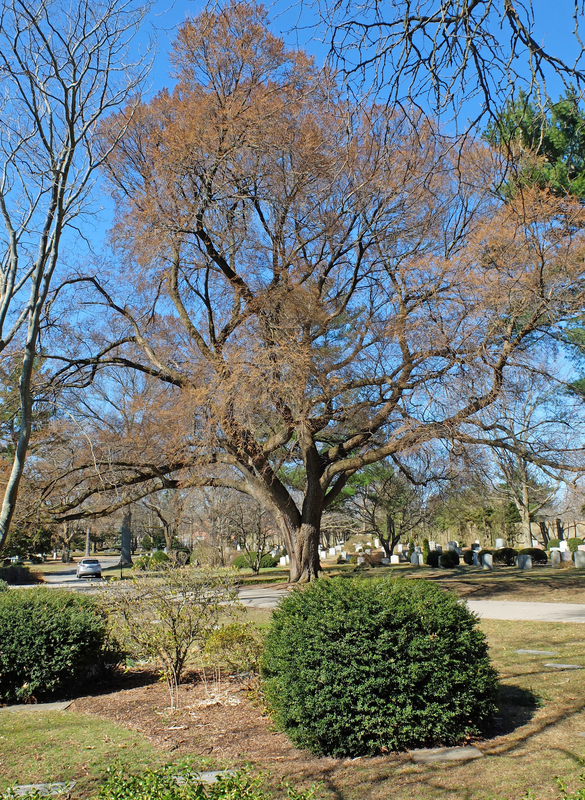 After more than half-a century of research with numerous cultivar selections, no American elm has proven totally resistant to DED. Some however, are tolerant and recover after infection. 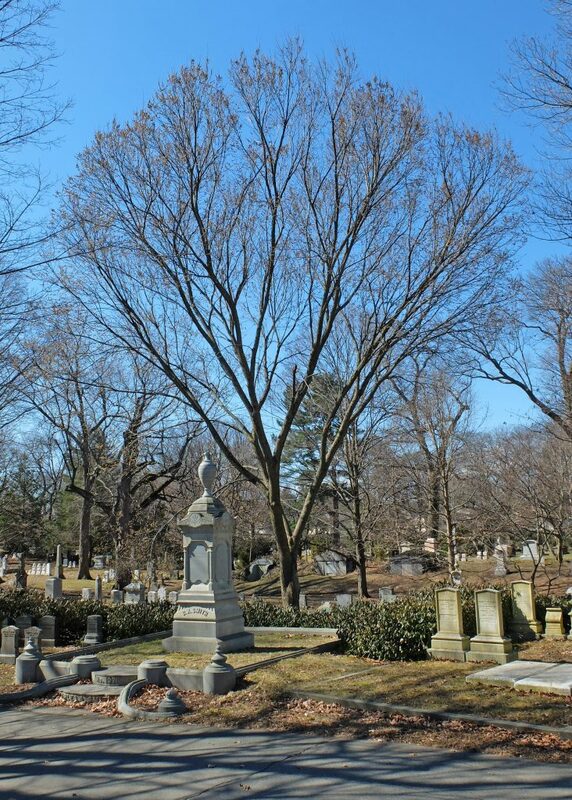 While American elms will never regain their former prominence, their American tragic saga also provided urban forestry with the lesson to forever avoid the danger of monoculture plantings, as was often common, sometimes near ubiquitous, with American elms. This has led some advocates to consider as a guideline, a 10-20-30 goal. Plant no more than 10% of any one species, plant no more than 20% of any one genera, plant no more than 30% of any one family. The true goal being to ensure genetic diversity within all urban tree canopies. 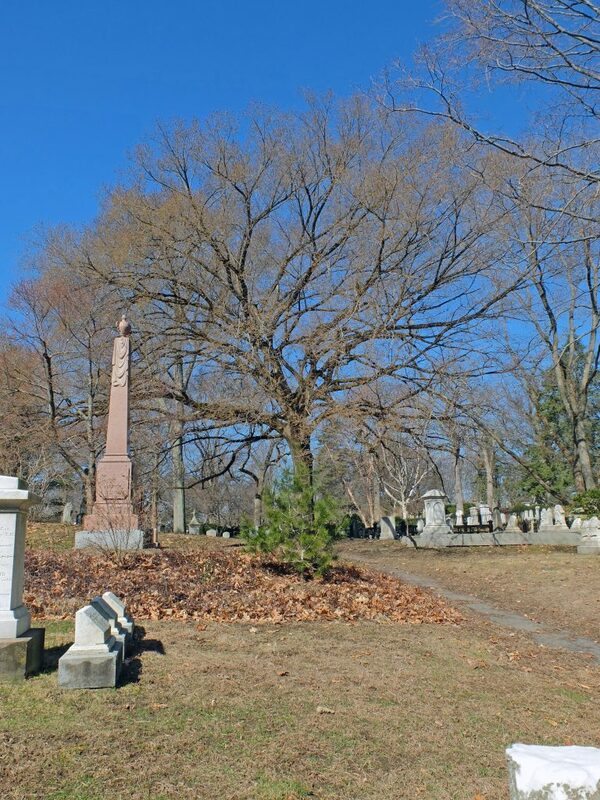 On a future visit to Mount Auburn look for some of our grandest mature straight species of American elms on Asclepias Path, Pond Road and Bluebell Path. 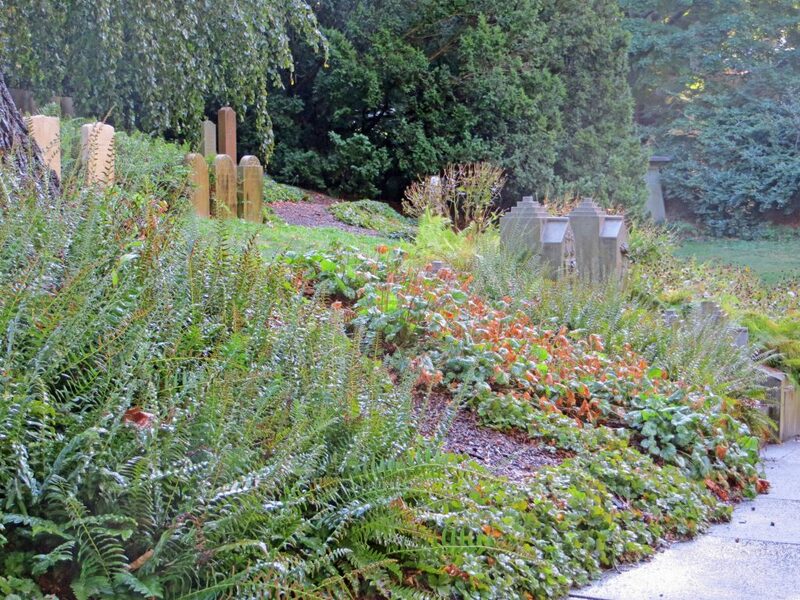 Other fine examples are found on Arethusa Path, Bigelow Avenue, Harebell Path and Garden Avenue among other locations. 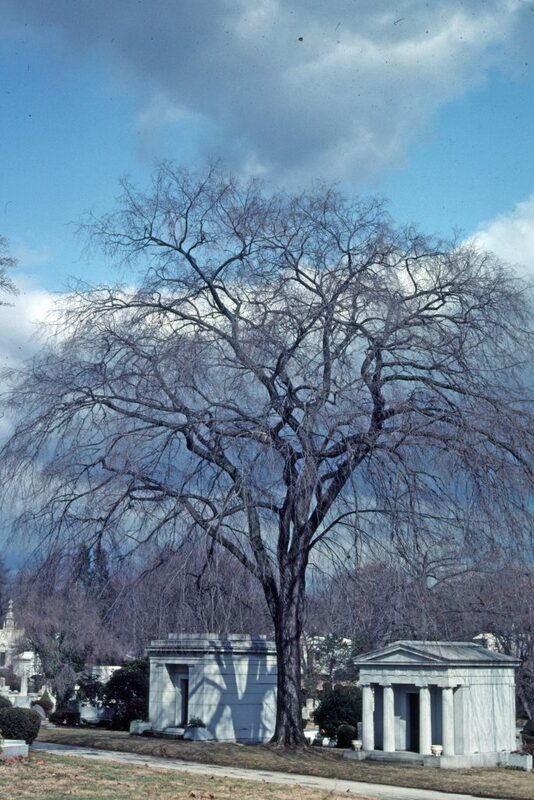 We also have cultivars of ‘Princeton’ on Fir Avenue, Heath Path, Honeysuckle Path, and cultivars of ‘Liberty’ on Fir Avenue, Field Road and Ailanthus Path. …The lovers disappeared into the wood. 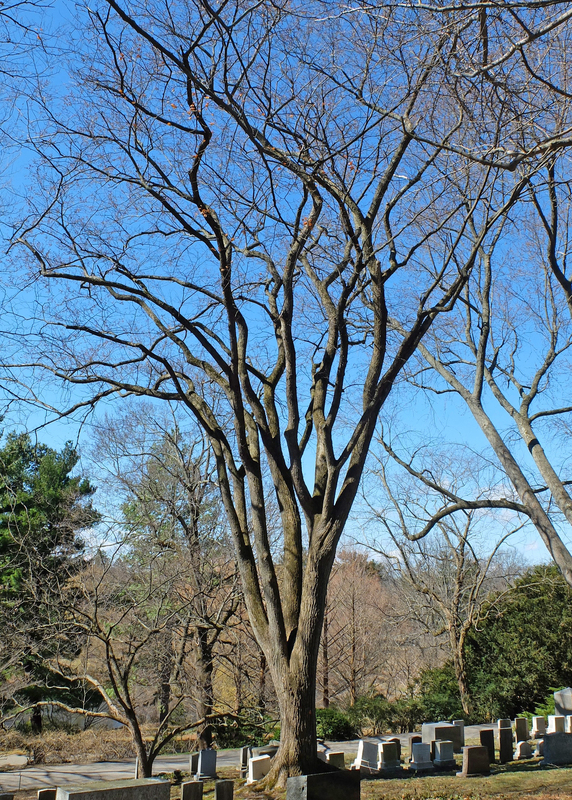 Wildlife enhancement has been an institutional priority at Mount Auburn for decades, and one of the most dramatic and significant initiatives has been the multi-year phased woodland restoration in Consecration Dell, a beautiful area with steep forested slopes and a vernal pool at its center. The Dell is ecologically significant in large part because of the diverse populations of migratory and resident birds it attracts each year, making it a destination for birdwatchers from near and far. 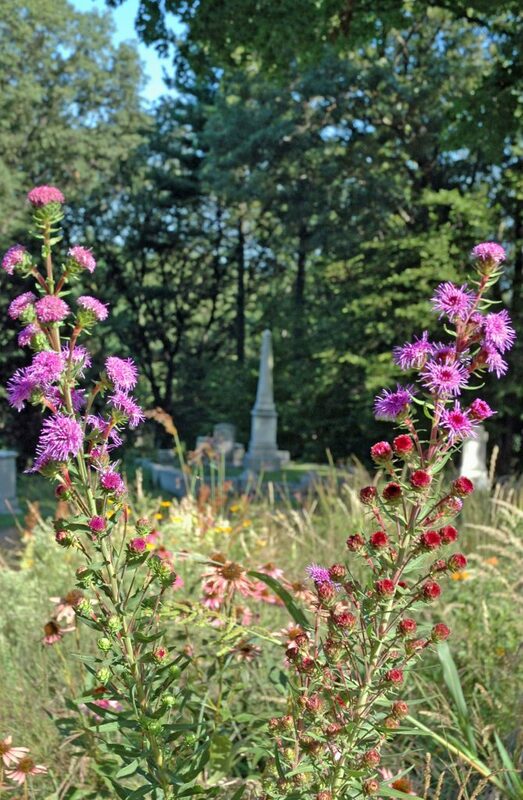 Work to restore the Dell to a more natural state began in 1995 with the planting of native species near the banks of the vernal pool, and in 1997 we undertook our first large-scale planting project geared specifically towards wildlife habitat. With support from grants and individual gifts, we have expanded this habitat farther out from the space immediately surrounding the vernal pool, covering most of the woodland slopes surrounding it. 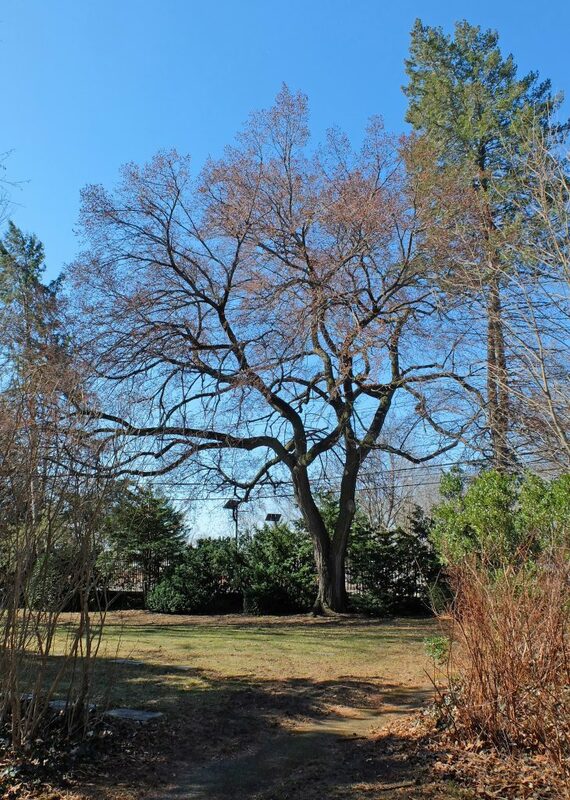 Over the years we’ve added many thousands of plants comprising over 128 different native New England species of trees, shrubs, ferns, and other groundcovers. The woodland habitat has improved greatly and certainly attracts birds—especially migrating warblers—and birders as well. Our latest step is to expand the woodland habitat to a new adjacent area, the North Dell Meadows, located atop the Dell’s northern slopes. This project is an expansion of habitat restoration work that we have undertaken over the past twenty-plus years, bringing our improvements into a new adjacent area in order to create contiguous habitat. We will utilize landscape improvement techniques that proved effective in previous projects in the Dell to install a sustainable native plant community appropriate for the area’s conditions. 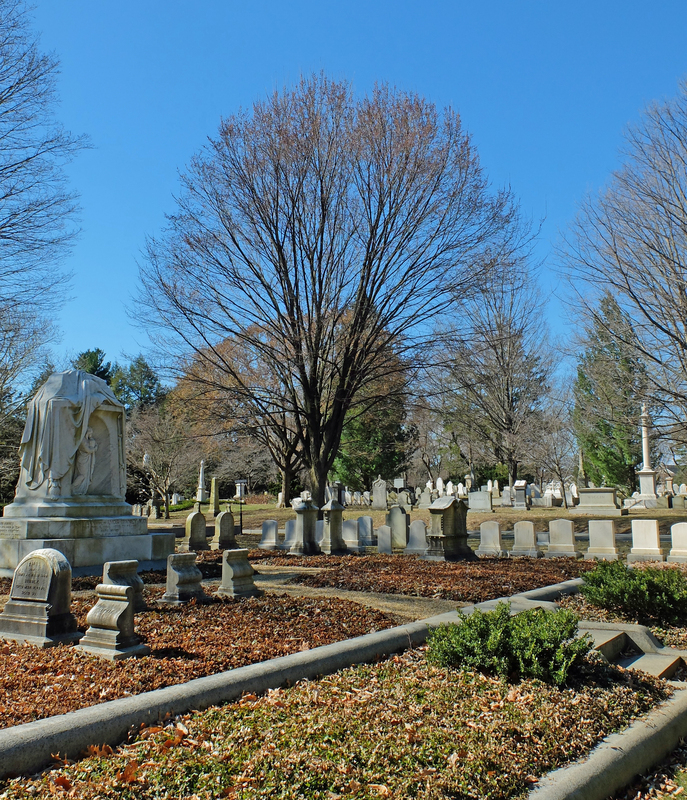 Altogether, Mount Auburn will purchase more than 13,600 plants to be installed in this project, which covers 8,200 square feet. Over the course of our twenty years of replanting in the Dell, we have recognized that the quality of vegetation is paramount when considering the effectiveness of wildlife habitat and the long-term ecological vitality of a site, so that is a top priority in our specific planting decisions. Coneflowers and mountain mint at the Washington Tower wildflower meadow. A blend of naturalistic un-mowed grasses and wildflowers will form the underlying basis for an ecosystem that offers a multitude of benefits for pollinators and other insects, especially during the summer months. Masses of Fragrant Sumac, Virginia Rose, and Sheep’s Laurel will form sweeping drifts of vegetation that provide food sources, protection, and nesting opportunities for a wide range of species as well. Other herbaceous plants that will be added to the meadows include Coneflower, Mountain Mint, and New England Blazing Star. In addition, 329 trees and shrubs will be planted in ways that emphasize naturalistic massing, which features a contiguous grouping of different shrub and small tree species to form an intermediate layer in the woodland understory. The insect populations served by such a habitat are an important food source for migratory and resident bird populations at Mount Auburn. This “shrubland-habitat” is one that many birds use, and the expansion of these various habitat resources will be a new and important resource for the birds around the Dell. at the Washington Tower wildflower meadow . Our 175-acre landscape has been recognized as a valuable green space in the increasingly urbanized Boston area, both as an oasis for the public and as an urban wildlife refuge. Developing sustainable habitat in the landscape has been an institutional priority for over two decades and was formalized in 2014 when our staff worked with a team of experts – ecologists, hydrologists, environmental engineers, ornithologists, herpetologists, landscape designers, and master planners – to create an official Wildlife Action Plan. Its goal was to assess our established habitat projects, and to develop a plan for future actions. The complete plan was released in 2015 and has been informing our decisions on maintaining our landscape as a sustainable habitat ever since. Native ferns and wildflowers at north end of Consecration Dell. 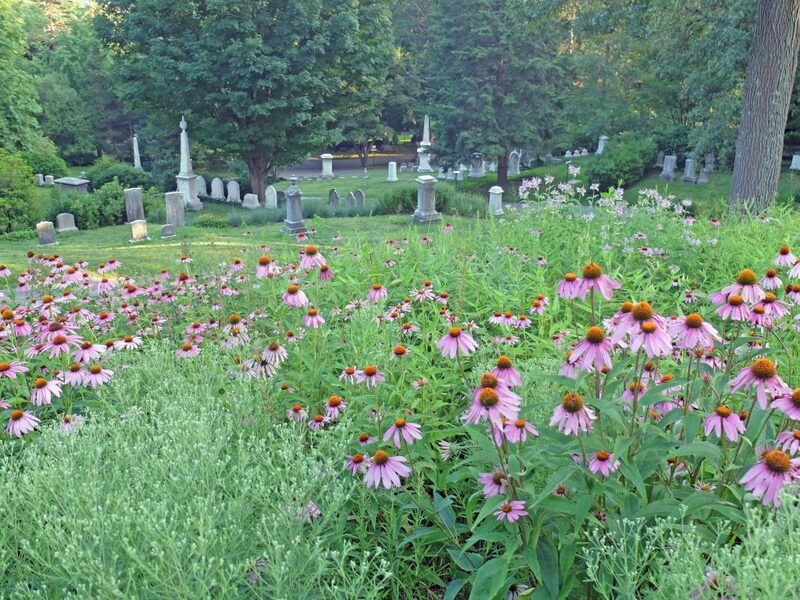 The variety of habitat enhancement projects that we have completed to date, both in Consecration Dell and elsewhere in the Cemetery, all represent important steps in our ongoing effort to manage Mount Auburn as an urban wildlife sanctuary. Each site was designed with specific long-term habitat goals in mind. However, until they are linked together to form a large area of contiguous habitat-rich landscape, their value will not be fully maximized. 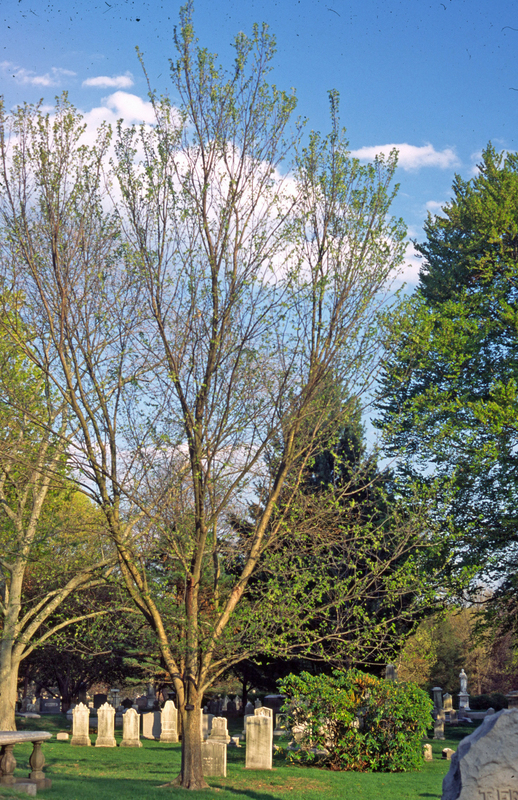 Our goal of connecting a large part of Mount Auburn’s core to form a cohesive area of diverse habitats will enhance the effectiveness of each of the pieces we have built over the years. The North Dell Meadows are located at the northern end of the Dell and just south of the Narcissus/Beech Wildlife Corridor, and once replanted, will provide an essential link between these different but mutually-supportive wildlife habitats. Please help us to protect urban wildlife because their survival is in our hands. To make a gift and join us in restoring native habitat, please click here. 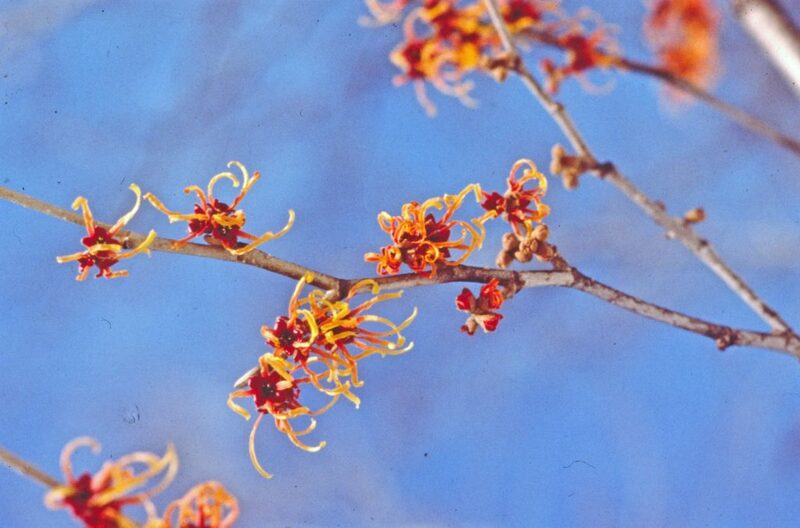 Questions of bean gender aside, there are occasional, horticultural, true-love stories within our ongoing pastime of “who does your garden grow?” Prime example this time is our late-winter, blooming beauty, ‘Jelena’ Witch Hazel, Hamamelis xintermedia ‘Jelena’ (pronounced Ya-lay-na). This love story commenced in what is today the Kalmthout Arboretum, outside of Antwerp, Belgium, in the mid-1950’s. A century earlier the site began as a plant nursery, passing through two different lengthy ownerships before World War I and the ensuing economic collapse finally closed the business. In 1952 Robert de Belder (1921-1995) and his brother Georges bought the then overgrown, weed covered land/estate. 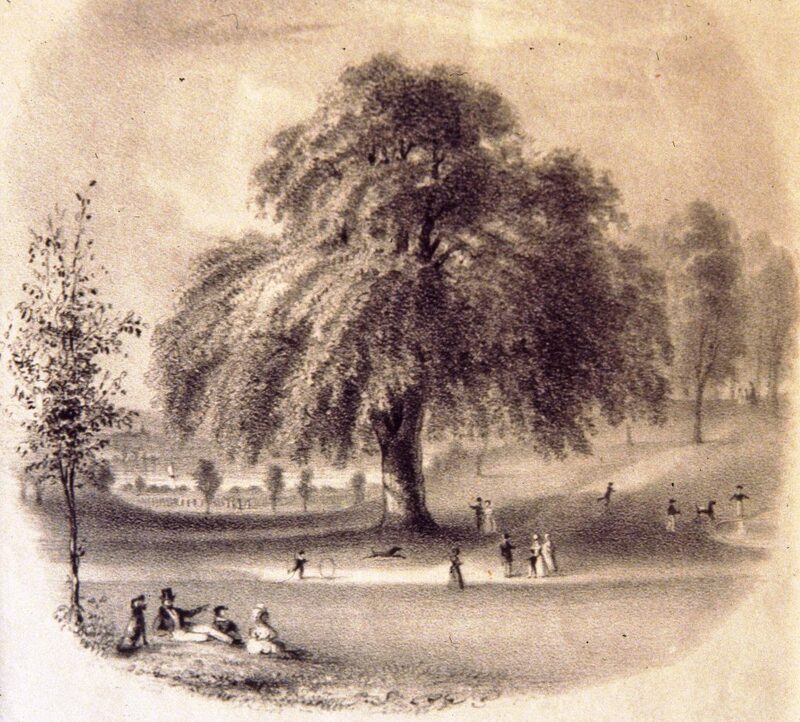 In a raison d’etre echo to Mount Auburn’s and Longwood Gardens’ beginnings, the de Belders, local diamond traders, bought the site to preserve the mature and even rare trees from a proposed housing development. On a separate life path, heading towards convergence, we introduce Jelena Kovacic (1925-2003), born in what is now Croatia, with a 1951 agronomy degree from the University of Zagreb. With a rare travel permit abroad, this botanist/horticulturist was in 1953/54 studying nurseries and horticultural sites in Denmark, Germany, the Netherlands and ultimately Belgium. Hearing about mature, rare Stewartias along with other ancient trees brought her to the de Belder’s new work-in-progress. 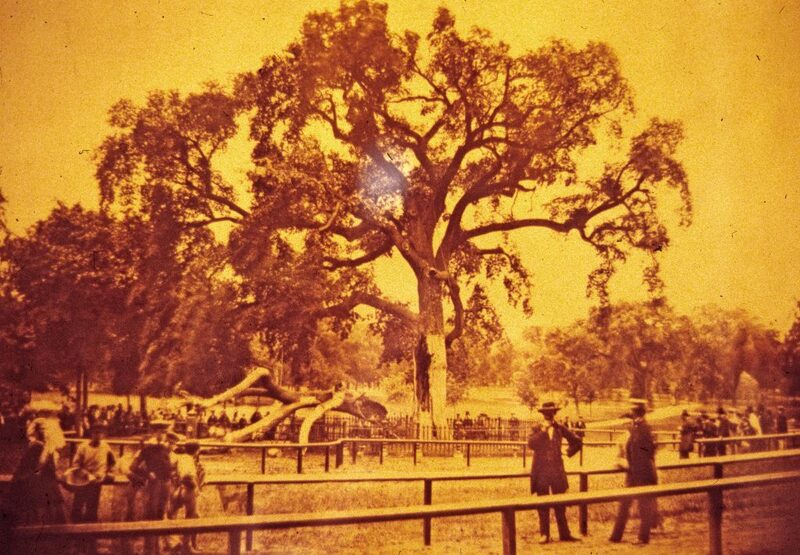 A romance quickly developed with Robert, and these plant aficionados were married within three months. Jelena joined the de Belder brothers, working to restore, replant, re-design and enlarge the long fallow property using a naturalistic style. The extensive plant diversity on the property included thickets with hybrids of witch hazels from the earlier nurseries. One attractive unnamed selection, shown at the Royal Horticultural Society in London, in 1954, was very popular. 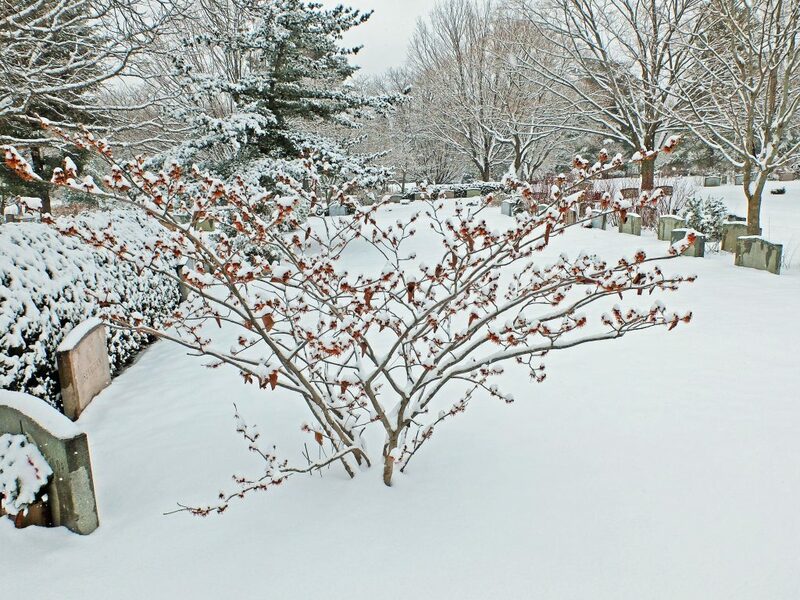 Robert named this Hamamelis xintermedia ‘Jelena’ in honor of his new wife. 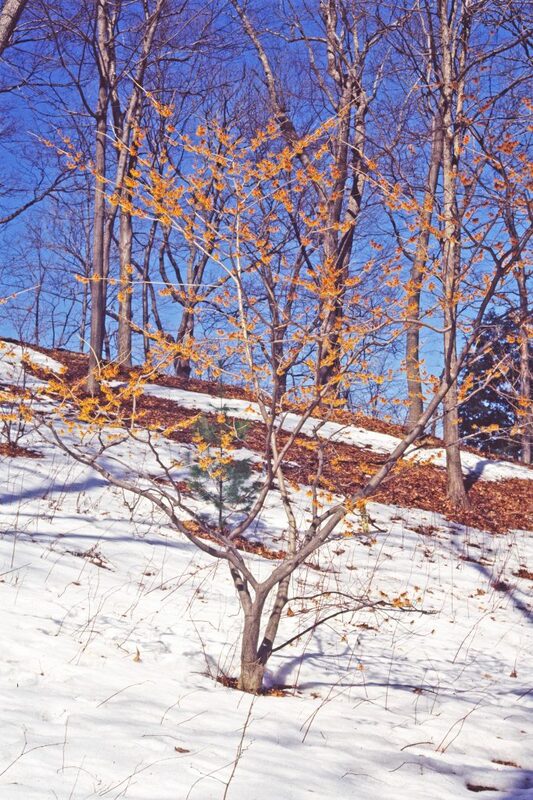 Hamamelis, a small genus with but four (five) species worldwide, produce spider-shaped yellow or orange flowers, each with four, one-half-inch-long, narrow, strap-shaped petals. 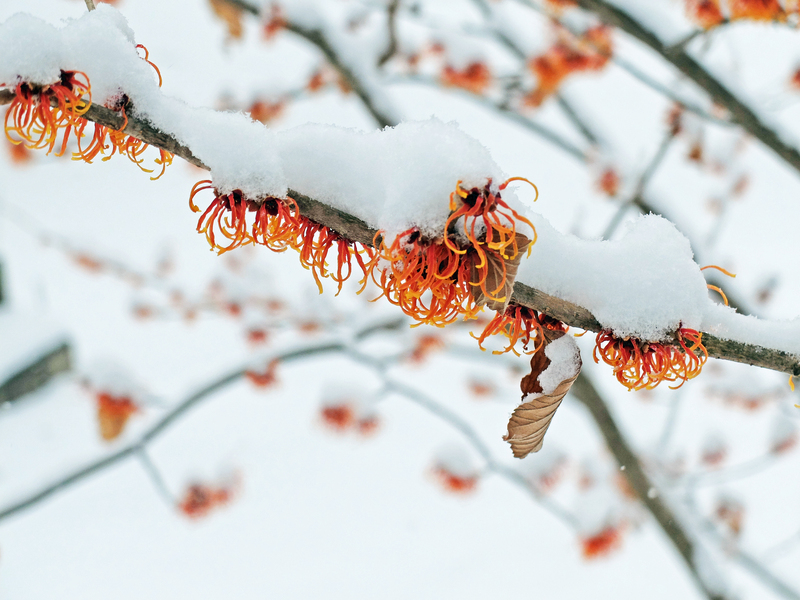 The two Asian species and their hybrids (crosses of Chinese and Japanese witch hazel) curiously produce their flowers during February and March. ‘Jelena’ in bloom, at first glance has a warm coppery-orange color. 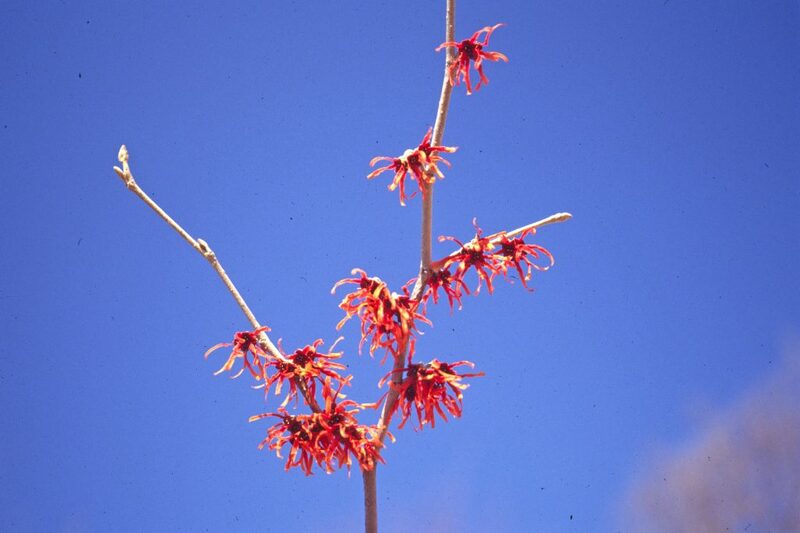 Look closer at the flowers to often see petals with reddish bases, orange centers and yellow tips. Our ‘Jelena’ Witch Hazels on Snowdrop Path, Buckthorn Path and Sparrow Path have shimmered in the otherwise sparse winter landscape after each of the modest February snowfalls we have had so far. 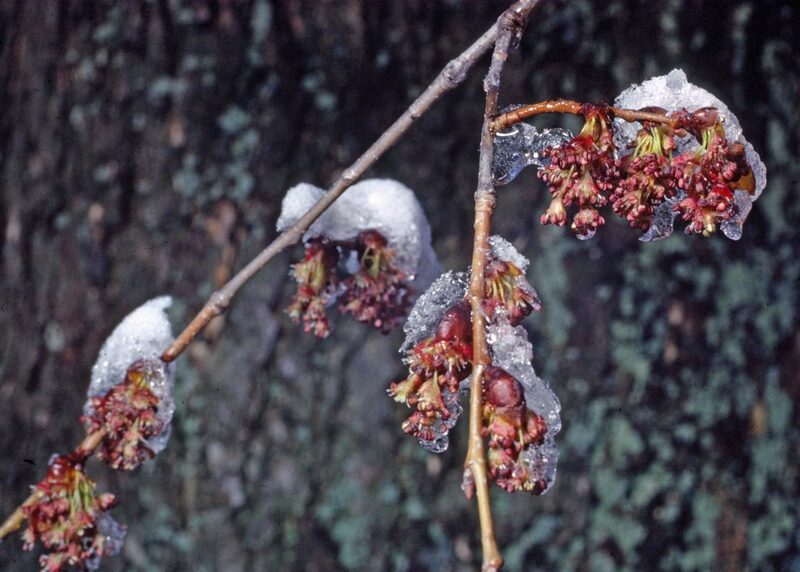 The tiny petals protectively curl up during extreme cold and more serious snowstorms, which allows the flowers to last four to seven weeks. ‘Jelena’ additionally will provide attractive red-orange autumn colored leaves. 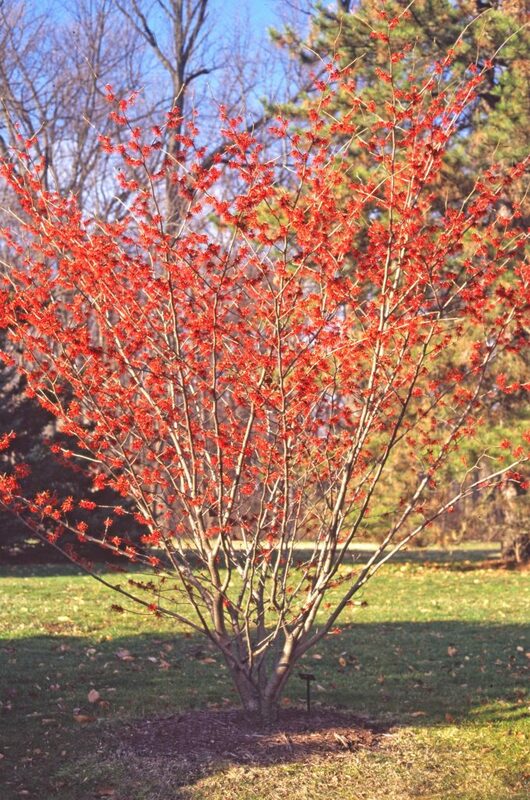 The de Belders achieved notoriety for breeding Hamamelis cultivars and another winning selection was ‘Diane’, a striking red-flowered cultivar. 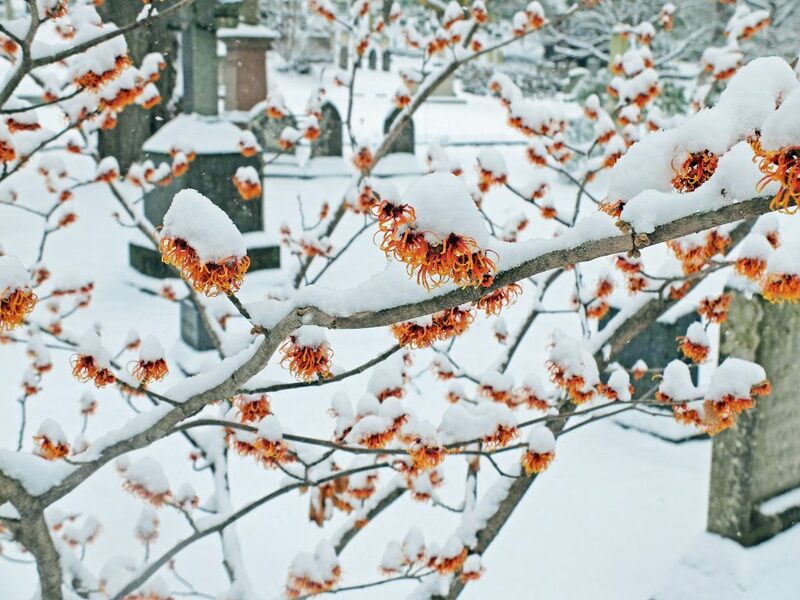 Hamamelis xintermedia ‘Diane’ was named to honor Jelena and Robert’s daughter. A fine specimen of ‘Diane’ may be found on the southern end of Indian Ridge Path. Both Hamamelis xintermedia ‘Jelena’ and Hamamelis xintermedia ‘Diane’ have received the Royal Horticultural Society’s Award of Garden Merit. 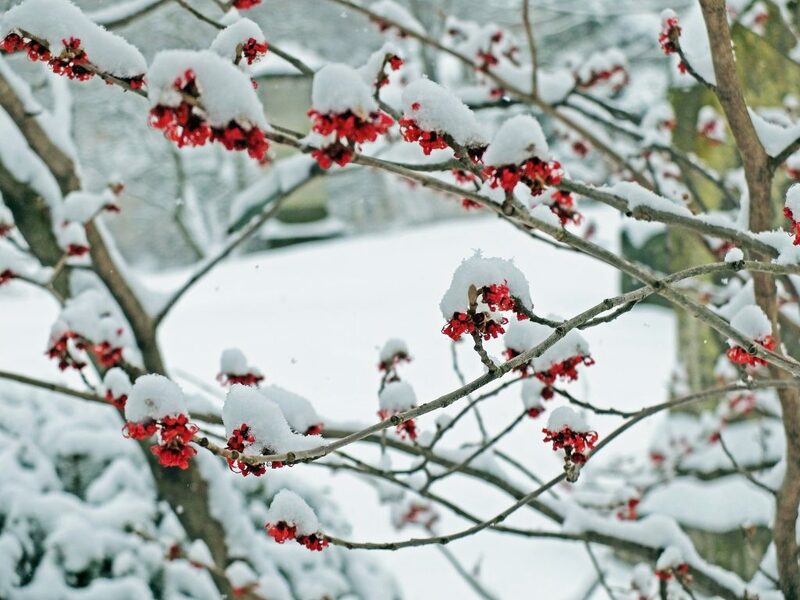 Look for these winter beauties along with other witch hazels as the calendar turns to March.